Nona Faustine was born and raised in Brooklyn, New York. She is a graduate of The School of the Visual Arts and The International Center of Photography at Bard College MFA program. Her work focuses on history, identity, and representation, evoking a critical and emotion understanding of the past and proposing a deeper examination of contemporary racial and gender stereotypes. Faustine’s images have received worldwide acclaim; they have been published in a variety of national and international media outlets such as Artforum, The New York Times, Huffington Post, Hyperallergic, The Guardian, The New Yorker, and The Los Angeles Times, among others. Her work has been exhibited at Harvard University, Rutgers University, Maryland State University, Studio Museum of Harlem, Brooklyn Museum, African American Museum in Philadelphia, Schomburg Center for Black Research in Harlem, the International Center of Photography, Saint John the Divine Cathedral, and many other institutions around the country. Her work is in the collection of the David C. Driskell Center at Maryland State University, Studio Museum of Harlem, Brooklyn Museum, and the Carnegie Museum in Pennsylvania. Her work is currently on view in the group exhibition Perilous Bodies at the Ford Foundation Gallery. Beatrice Glow is an interdisciplinary artist who leverages participatory performance, painting, experiential technology collaborations, olfactory art, sculptural installations, and video to shift dominant narratives. She is a 2018–2019 Smithsonian Artist Research Fellow and 2018–2019 Smack Mellon Studio Program Artist. She was a 2017–2018 ZERO1 American Arts Incubator artist amplifying indigenous and Afro-Ecuadorian voices. Her 2016–2017 Asian/Pacific/American Institute at New York University residency led to virtual and augmented reality projects “The Wayfinding Project” and “Mannahatta VR,” and public installation “Lenapeway” in allyship with indigenous environmental stewardship. She received a 2013 Franklin Furnace Fund grant for “Floating Library,” a pop-up public space aboard the Hudson River’s Lilac Museum Steamship, which attracted more than four thousand visitors. As a 2008–2009 Fulbright Scholar, she developed a migratory museum and trilingual artist book on Asian migration to Peru. Notable activities include solo exhibitions Spice Roots/Routes (2017) at NYU Institute of Fine Arts, Aromérica Parfumeur (2016) at Museo Nacional de Bellas Artes de Chile, and Rhunhattan Tearoom (2015) at Wave Hill; group shows at Honolulu Biennial 2017, Park Avenue Armory, and Galeri Nasional Indonesia; and a Duke University Press’ Cultural Politics Journal artist feature. As a Hemispheric Institute council member, she co-founded the Performing Asian/Americas: Converging Movements workgroup. John Kuo Wei Tchen is a historian, curator, and writer. Professor Tchen is the Inaugural Clement A Price Chair of Public History & Humanities at Rutgers University – Newark and Director of the Clement Price Institute on Ethnicity, Culture & the Modern Experience. He is founding director of the A/P/A (Asian/Pacific /American) Studies Program and Institute, and part of the founding faculty of the Department of Social and Cultural Analysis at New York University. In 1979–1980, he co-founded the Museum of Chinese in America, where he continues to serve as senior historian. He was the senior historian for a New-York Historical Society exhibition on the impact of Chinese Exclusion Laws on the formation of the United States, and also senior advisor for the two-hour “American Experience” PBS documentary with Ric Burns and Lishin Yu on the “Chinese Exclusion Act.” Yellow Peril: An Archive of Anti-Asian Fear (2014) is a critical archival study of images, excerpts, and essays on the history and contemporary impact of paranoia and xenophobia. Tchen is also a founder of the New York Newark Public History Project (NYN PHP), funded by the Ford Foundation, which will reframe the history of the estuarial region starting with the twined foundational histories of dispossession and enslavement (work emerging from serving as a Commissioner on the NYC Mayor’s Commission on Monuments.) His Below the Grid Project is pioneering creative historical storytelling with smart, location-sensitive wearable tech. Images: Rhunhattan [Tearoom]; Beatrice Glow; 2015; installation view at Sunroom Project Space, Wave Hill Public Garden and Cultural Center, Bronx, New York; acrylic and decal collage on ceramics, ink on paper, and terra cotta infused with scents of colonial commerce; dimensions variable. Mannahatta VR (work in progress) is an interactive virtual reality experience that envisions the pre-colonial landscape and sustainable futures of New York through the collaborative lens of Native culture bearers, artists, technologists, ecologists, and historians. This is a collaboration between Beatrice Glow, The Wayfinding Project at the Asian/Pacific/American Institute at New York University, and Alexandre Girardeau of Highway101, ETC. Featured in this image is Chief Vincent Mann, Turtle Clan Chief of the Ramapough Luunape Nation. 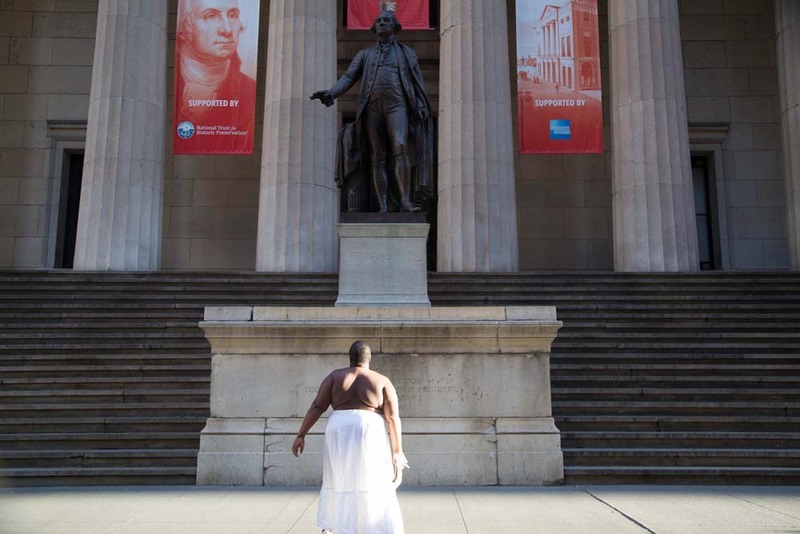 “…a thirst for compleat freedom…had been her only motive for absconding.” Oney Judge, Federal Hall NYC; Nona Faustine; 2016; archival pigment print; 27 x 40 in. ©Nona Faustine.